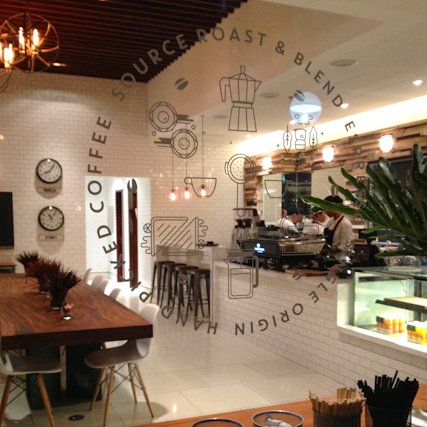 These days, third-wave coffee shops are popping up left and right. You’ll recognize them by their cozy, creative interiors, the absence of blended coffees on their menu, and—more often than not—the blackboard listing their featured beans of the moment. These are the places where sugar is not a standard addition to a cup of joe, brewing methods are a menu category of their own, and coffee is regarded as both an art and a passion. 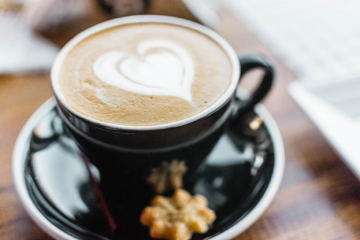 If you’re looking to venture beyond your usual chains, here are some of the specialty coffee shops that you should check out. Who knows, they might just convert you to a no-sugar type of drinker before you know it! EDSA Beverage Design Group may be tricky to find at first, but once you know where it is, you’ll want to keep on coming back. 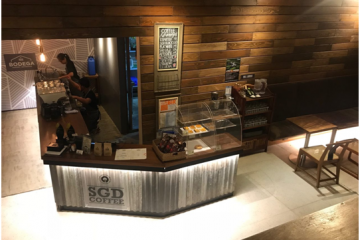 As its name suggests, it’s located right along EDSA’s southbound stretch—specifically, in the CLMC Building past the Shell station with Shakey’s. Enter the dark glass door marked “In pursuit of the noble beverage,” and you’ll find yourself in the first floor of their studio, which serves as their laboratory. Here, they develop beers and coffees that they supply to shops such as Third District and El Union. Right up the stairs is the cafe, where you can order a cup of coffee prepared by their champion baristas. Food offerings are on hand to take you right through dinner, when you can put aside your joe for a specialty cocktail or craft beer. 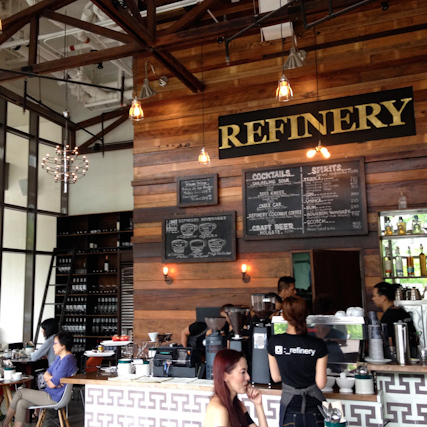 With its high ceiling, wood-paneled wall, accent tiles, and beautifully mismatched chairs, Refinery makes for a lovely hangout spot in the Rockwell area. 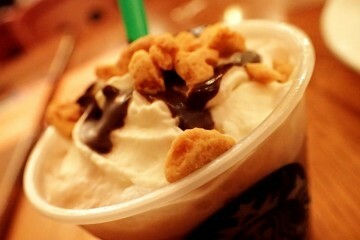 Their coffee menu will delight those who want different flavors in their cuppa. You can choose from espresso concoctions such as their Salted Caramel Latte, Orange-infused Cappuccino, and—our personal favorite—Valrhona Mocha, or relish their featured Lamill beans prepared in your brewing method of choice. Also available is a wide range of teas and cocktails, and you should definitely not miss out on their delicious food. Double Truffle Fries, Grilled Cheese with Basil and Honey, and the Refinery Burger are just some of the dishes you can look forward to feasting on here. 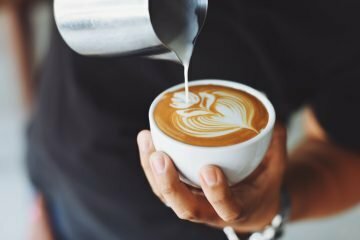 While most third-wave coffee shops use a variety of brewing methods to prepare your coffee, Habitual focuses solely on one—the AeroPress method, which uses a plunger to extract the natural flavors of coffee while keeping bitterness to a minimum. They’ve even developed their own way of making cold brew, a refreshing drink served black, white, with mint, or in their unique Old Habits Die Hard mix. In fact, they’ve made such a science of brewing with AeroPress that their cofounder Kaye Ong was named the 2015 Philippine AeroPress Champion and will be competing internationally. 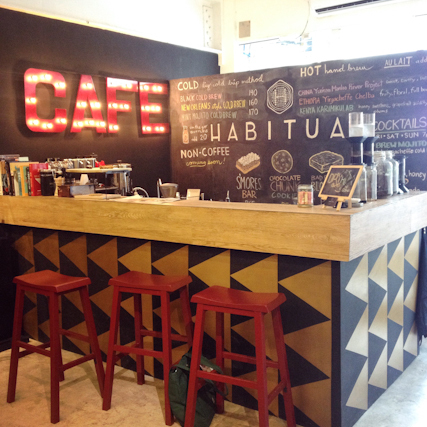 Like the other places on this list, Habitual also serves sandwiches, pastries, cocktails, and teas—all of which you can enjoy among the interesting artsy products of the Edition Lifestyle Store. Australia has long been known for its rocking third-wave coffee scene, and we get to experience a taste of that in the Aussie chain Toby’s Estate. Although it’s only been in the country for a little over a year, already, it has five branches—two of which offering a substantial food menu—and there are more in the pipeline for 2015! One must-try that you won’t find on the menu is their velvety Gibraltar, and we’re all raves for their cappuccino and mocha (with chocolate from Ghana) too. 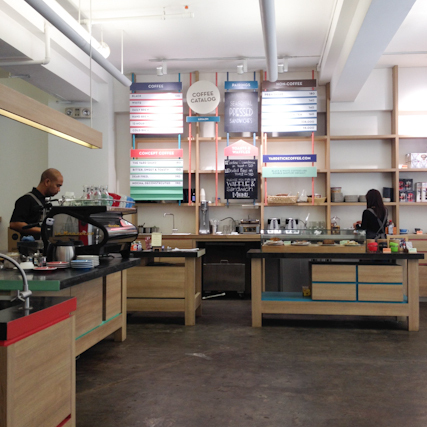 Of course, they’ve got a Slow Bar for your pour-over coffee fix. Also check out their desserts and meals, which are delicious and filling if a bit expensive.